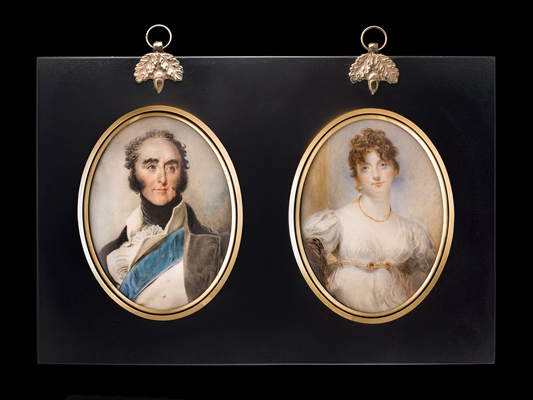 John Inigo Wright exhibited at the Royal Academy between 1795-1819 and is perhaps best remembered for his striking copies on ivory of works by the numerous great artists of the day, including Sir Thomas Lawrence and John Hoppner to name just two. Much of Wright’s life remains a mystery, including his exact date of birth, but we do know he married twice and his first wife died whilst giving birth to his first son John William Wright. Wright worked on both rectangular and oval shaped ivory and the faces of his sitters tend to show a distinctively powerful resonance with the larger works of Lawrence. The Marquess of Abercorn was one of Lawrence’s earliest and frequent patrons and regularly entertained the artist at Abercorn House in Stanmore Priory, Middlesex. Abercorn was created Marquess in 1790 after succeeding his uncle as 9th Earl the year before, and the present portrait miniature is a reduced scale version of the full-length exhibited by Lawrence at the Royal Academy in 1814 [Duke of Abercorn collection] and shows the Marquess wearing the insignia of the Garter. The portrait miniature of his wife, Anne, is based on a likeness by Lawrence painted just after her marriage to Abercorn c.1800 [New Orleans Museum of Art]. Lady Anne Jane Gore was the eldest daughter of the 2nd Earl of Arran and widow of Henry Hatton of Clonard, county Wexford and she married Abercorn as his third wife in 1800.